The flag of the United States of America, also known as the Stars and Stripes, Old Glory, the Star Spangled Banner, or even the Red White and Blue, is the official standard under which Americans identify themselves to the world. The flag is composed of thirteen horizontal and alternating red and white stripes with a blue rectangular field in the canton (top left corner) that is filled with fifty five pointed white stars. 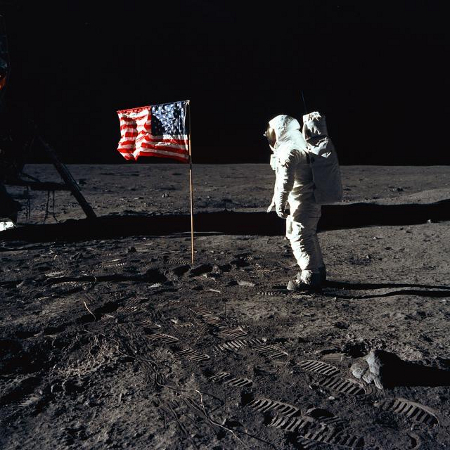 The US flag is unique in the world and clearly identifies US soil or interests wherever it flies. When the thirteen colonies of British North America south of Canada declared their independence from Kingdom of Great Britain on July the 4th 1776 the new United States of America had no flag or any other official emblems. Sadly, the peace and prosperity that George Washington and the Continental Congress hoped for was quickly dashed as Great Britain immediately declared them to be in rebellion and engaged her formidable military to put an end to the rebellion. Needing a banner under which the fledgling US army and states militias could rally, a small group of congressmen including Benjamin Franklin, Thomas Lynch, and Benjamin Harrison created the first flag which became known as the Continental Colors. The Continental Colors were flown for the first time on New Years Day 1776 and was made up of thirteen red and white horizontal stripes and a British Union Flag in the canton. The Continental Colors became the official flag of the US Navy in 1776 and was hoisted on all US maritime ships as well as in ports controlled by the United States. After the declaration of independence and the revolutionary war had begun in earnest Washington was advised that in fact an almost identical flag was being used by the East India Company. This in itself wasn’t a major problem but the use of the Union Jack in the canton led many British generals to falsely assume the colonists had surrendered and reverted to crown loyalty. In 1777 the US Congress approved an act establishing a new flag for the United States which has since become known as the Betsy Ross flag and looked similar to the old Continental Colors but the canton was changed from the Union Flag to a blue field with thirteen white stars . Traditionally these were arranged in a circle but in fact there were no rules for their arrangement and many flagmakers arranged the stars in rows or other patterns that appealed to them. The thirteen stars came to represent the Sates of the Union, the first thirteen being Delaware, Pennsylvania, New Jersey, Georgia, Connecticut, Massachusetts, Maryland, South Carolina, New Hampshire, Virginia, New York, North Carolina, and Rhode Island. Some historians believe the thirteen red stripes of the Continental Colors were chosen to represent the original thirteen states which makes the explanation of the thirteen stars in the Stars and Stripes flag puzzling. The Stars and Stripes Flag is also known as the Betsy Ross flag, after claims that Betsy Ross made the first American flag surfaced in 1870. Her grandson William Canby presented a paper to the Historical Society of Pennsylvania in which he related a family story about George Washington, Robert Morris, and Colonel George Ross approaching Betsy Ross in her shop to make a flag for them. They had been appointed by Congress to form a flag committee to design and then procure the services of a flag maker to replace the existing Continental colors. 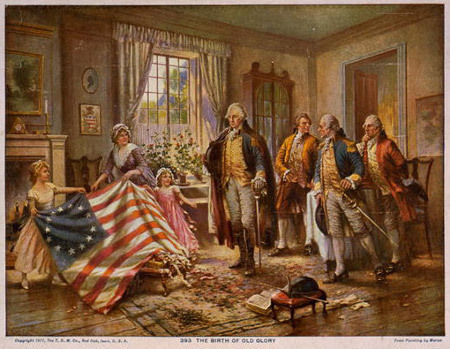 Sadly, Betsy Ross’ story cannot be verified since nowhere in the Congressional Library, or amongst any of the personal letters or receipts of these four people is any mention of a flag committee or of Betsy Ross being asked to make that first flag. Historic evidence actually points in other directions. Prior to the Continental Colors being used there had been other flags in use within the colonies that bore 9 or 13 horizontal stripes with a canton in the top left corner so the inspiration for the design of the Stars and Stripes pre-dates any of the legends. The most likely designer of the US flag is a man by the name of Francis Hopkinson who in 1780 designed the Great Seal of the United States, and in letters and invoices sent by him to the Continental Board of Admiralty he requested compensation for not just the Great Seal, but also for other designs including the flag of the USA. Francis Hopkinson had been active in the declaration of independence, actually being a signatory to the declaration and one of the first congressmen. With the admission of other states into the union, the flag started to be less relevant, and by 1795 Congress ordered the design should be changed to reflect the new reality of 15 states, Vermont and Kentucky having joined in 1791 and 1792 respectively. The Stars and Stripes were changed to fifteen red and white horizontal stripes, and fifteen white stars in the canton. Unfortunately Tennessee joined the Union a year later making the new design outdated again, but it wasn’t until 1818 that the situation was rectified. President Monroe, the fifth elected President of the United States signed in 1818 a new flag act returning the flag to thirteen red and white stripes in honor of the foresight shown by the founding states, and specified that the canton would from that day on contain as many white stars as there were states of the Union with new stars added on the 4th of July following their admission to the United States. The flag was updated in 1818 to include the states of Tennessee, Ohio, Luoisiana, Indiana, and Mississippi, but by 1820 had been updated again to include Illoinois, Alabama, and Maine. This arrangement has worked very well and is an enduring symbol of the US that also reflects the equality of the states and their importance as united states in a single republic. In the 1950s when Alaska and Hawaii were about to be admitted to the Union a tremendous amount of excitement surrounding the layout of the 49 and 50 white stars resulted in President Eisenhower receiving over 1500 submission from members of the public. In 1912 an executive order from President Taft had fixed dimensions of the flag and decided that the stars were to be arranged in 6 rows of 8 columns with each star positioned so that one point always faced the top edge of the flag, but President Taft’s arrangement wouldn’t have allowed the inclusion of Alaska and Hawaii under the original rule set out from 1818 that each state should be represented by a single star in the canton. In the event the Army Institute of Heraldry, who are the keepers of the design and arbiters of its use decided on the current layout of 9 rows of 6 and 5 alternating columns. An amusing story from the time was that a young man of 17 from Lancaster, Ohio took part in redesigning the US flag as a school project. Robert Heft painstakingly removed the 48 stars from an existing flag then made 100 new stars which he ironed onto the flag front and reverse in a pattern identical to the one eventually chosen. His teacher Stanley Pratt awarded Heft a B grade for the project, unfortunately Heft was no seamstress, but under discussion an agreement was reached that if Congress chose Heft’s design his grade would be upgraded. Before the high school year was out Alaska and Hawaii had joined the Union and President Eisenhower announced the new flag design. To Stanley Pratt’s credit he kept his word and Robert Heft was awarded an A.